It’s a busy week for the financial industry in Brazil, as CIAB Febraban, South America’s biggest banking conference and expo, gets under way in Sao Paulo. Our people in Brazil tell us that this year, they’ve been hearing a lot of buzz from Brazilian banks around network-attached and PC-free check scanning.Why the sudden interest? Largely because of the country’s extremely well-developed network of microbranches, quasi-branches, and correspondent banking agents that’s unlike any other in the world. To put the scale of Brazil’s meta-banking system in context, the FDIC reported that as of 2014, about 94,000 bank branches existed in the United States. Brazil’s largest bank, Bradesco, by itself operates more than 60,000 microbranches and correspondent banking centers throughout the country. The sheer ubiquity of the system, in shapes and sizes of all kinds, is truly impressive. Bradesco’s floating “bank branch on a boat” makes a stop along the Amazon River. So, here’s how network scanning fits into the picture. Some of these microbranches are miniature in-store branches like Americans are accustomed to seeing in grocery stores, only smaller (think 2-meter square areas with single counters). Others aren’t “branches” at all, but ordinary retailers where employees can accept basic transactions on behalf of the bank, and the bank pays the merchant on a per-transaction basis. At these locations, transactions aren’t being handled at a teller window, but at a cash register, often with nothing more than a point-of-sale card reader attached. These mini-branches and quasi-branches have a dual importance important in Brazil, where banks not only need to serve their standard urban/suburban customer bases – but also have to figure out how to provide services in thousands of remote towns and villages, often with no road access or limited infrastructure, and where the local population is not enough to support a full branch. 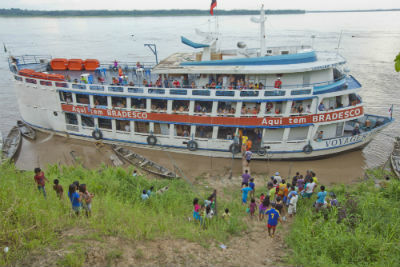 In the Amazon River basin, where waterways act as the primary means of transportation, Bradesco even operates a floating branch on a boat to provide service to some of the most isolated areas. So in these situations where there is not a traditional teller window, being able to operate a scanner independently of a PC, or to attach it to a point-of-sale system, opens up a whole range of new possibilities. Most of the transactions performed by correspondents are deposits or bill payments – and since post-dated checks are used as a credit system of sorts in Brazil, being limited to only cash and cards is a hindrance to both. Additionally, most correspondent bankers are assigned a transaction limit by the bank as a risk-prevention measure. That is to say, a retailer might be limited to accepting 1,000 reals’ worth of bill payments in cash, and then the system will go offline until he actually deposits the cash at a branch. This is understandable, since a corner store is most likely more prone to mistakes, fraud, or robbery than a full-fledged branch, and so the bank wants to limit the amount of cash and checks floating around in that less-secure environment at any given time. But, if checks can be deposited remotely, the retailer can handle more transactions with lower risk and less friction, making the whole system run more smoothly. Such a microbranch model is fascinating in the context of the U.S. market, where banks have been closing branches in small towns and rural areas at an alarming rate, often leaving citizens and businesses alike with few options for financial services. Critics of traditional banking have often questioned the sustainability of brick-and-mortar branches – and with an estimated 25-30% of branches reported as unprofitable, they may have a point. The question may not be if our branch networks change, so much as when and how., In cases where foot traffic struggles to support a traditional “full” branch, all trends seem to point toward downsizing: smaller physical locations, more automation and less staff, or “piggybacking” on existing infrastructure of other businesses. So in that event, it’s not too difficult to imagine our branch network of the future will look something like Brazil’s.